Why do we crave for more, at McDonalds? There are days, just like today, when I have this sudden craving for the Big Mac burger from the big yellow M, i.e. McDonald’s. And an ice-tea (or coke), along with fries is a must-to-have as soon as I enter through the glass doors! But has any of us ever wondered, why do we suddenly feel this rush, that compels us to order food in quantities, that we would have never had, had the food been from home? Watch: How McFries are made! This is the period when we start itching for more. The high levels of fructose corn syrup and sodium inside the bun leave us craving more of the same (and in the long term, this can lead to obesity, diabetes, and heart disease). Then the sodium – some 970 milligrams of it – causes dehydration and starts making the kidneys and heart work faster. Blood pressure rises, and you may well be tempted by a McFlurry or apple pie. The body is used to the grease already, and starts demanding for similar food, that has high sugar or salt content, like a chocolate. The gastrointestinal tract very quickly absorbs the high volume of fructose corn syrup we mentioned earlier, further adding to your hunger pangs. Slow digestion starts in earnest. Food typically takes 24-72 hours to digest, but the grease and trans fat inside a Big Mac means the digestion time for the McDonald’s signature burger can easily go beyond three days. Thus, try to keep the Big Mac to an occasional business only. This is precisely what leads to obesity and other health problems. 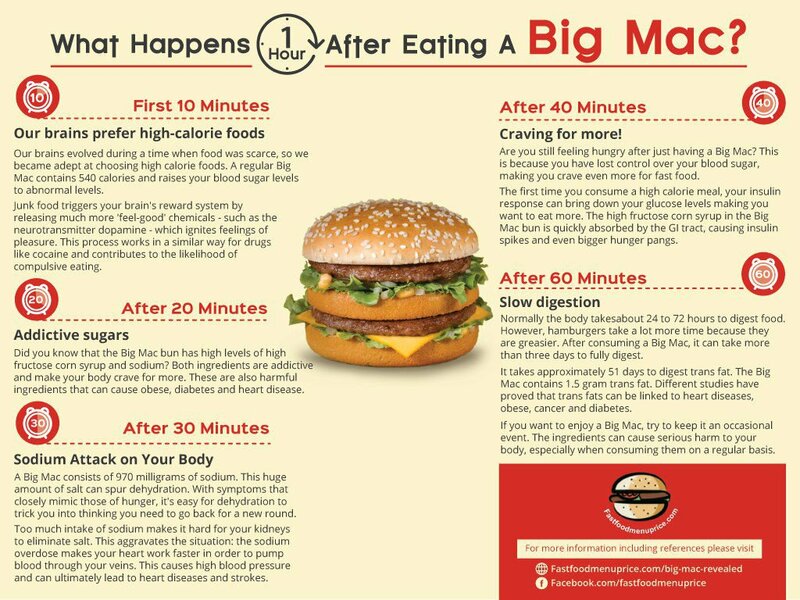 This is not just for Big Mac, but all other food joints, that might give you the cravings to eat bucket load of food! Previous Previous post: What Are The Healthiest Types Of Rice? Next Next post: Which food articles must not contain MSG, and Added Flavours?